In preparing for food needs during the hard times, think of the first 10 days, the first 30 days, and the first year. Then imagine no truck deliveries of food in your regional area for a year. What are you going to do? Most adults can survive without eating for two weeks, less so for children, and much less for infants. You should calculate 1500 calories per person per day in an emergency situation as a general rule of thumb. If you are travelling by foot to reach your destination, your safe place, remember somebody will have to carry this food as well as your water needs of 1 gallon per person per day. You will want to use calorie dense foods as your main source of sustenance during the first ten (10) days of your journey. See our Noah Bucket, for a good example. There are a number of high calorie bars available that use fat and sugar. Your family should try them out for palatability. Don’t worry about your protein needs for your first ten (10) days. That will come later. Peanut butter is the cheapest, calorie dense, readily available product. Prepackaged, high calorie soups are the best way to break the monotony of bars and help meet the fluid needs of approximately on and one half quarts of water per person per day. Remember, they will require cooking so don’t forget the lighter, fuel, and pan to cook in. Don’t plan on convenience stores or fast food restaurants being available. Some are not big fans of coffee but there are instant forms of the drink and flavored caffeine products in powder from that you can add to your drinking water to give you an added boost during stressful times. It will also help with physical exertion if you’re out of shape. If you have special dietary needs such as gluten-free or nut allergies, now is the time to make these preparations. It is important to remember that you could become a refugee in your own country amongst thousands of others should mass displacement occur. Imagine that your local emergency Red Cross, and FEMA are all overwhelmed with in the first 24-48 hours. What would you and your family do? Please plan for self-reliance now. 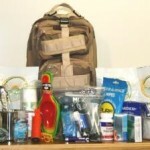 At minimum, have an emergency kit, like this one, for each family member. This would help you whether you are sheltering in place, or traveling to safety.